انشاء Syed Insha'llah Khan Insha, who was born in Murshidabad (Bengal) in 1757, was one of the greatest Urdu poets. At an early age he came to Delhi. Insha is also termed as the second Amir Khusro for his tremendous command on language. His intelligence and rivalry with another eminent poet of the age Mushafi [pronounced mus-hafi] are legendary. He also wrote 'Rani Ketki ki Kahani' without using Arabic and Persian words, that was latter appropriated as first written story in Hindi, leaving his entire contribution in Urdu which is never mentioned. He wrote the landmark daryaa-e-lataafat on nuances of language and also a divan where he didn't use a single letter that had 'nuqta' [as many as sixteen alphabets in Urdu have nuqta viz. be, pe, te, se, jeem, che, Khe, zaal, ze, Zhe, sheen, zo, Ghain, Fe, qaaf, nu]. Though there may be injustice to some extent* and often a feeling of persecution, but the nature of our democracy is such that it allows a person or group to give vent to their feelings publicly. Gujarat carnage aside, it is mainly the failure of Muslim leadership to raise real issues concerning Muslims. Otherwise the Hindu leaders and parties in even states like Tamil Nadu which have barely 5% Muslim votes, have championed the cause of minority and it is not just votes or appeasement alone, which prompts them to do it. In society, politics, media, there are non-Muslims who speak for Muslims. Otherwise, which group has not faced injustice! * The status of Dalits in Indian society is yet to improve much and tribal populace has suffered most from the apathetic administration. But that's the general problem of a bureaucracy, which is corrupt and insensitive. Muslims do have a much better social status despite their poor financial state. In Sports, Films, Arts and especially Indian traditional music, Muslim representation is more than their percentage. This shows that complaint of'bias' and 'communalism' doesn't hold much water. Of course, it is a casteist society so there is bound to be a feeling of discrimination experienced by each section, but Indian society is a much better evolved society with an interaction of Hindus and Muslims for over a millennium. In this democracy you can shout from the rooftop that you have faced bias at any office or any official of any rank has been guilty of partiality. There are a range of commissions where you can complain and media channels and a press that is absolutely free to give your story and tell them your grievances. And government jobs are not everything. We are lucky to have a great advantage in free media, where if nothing, at least if you are angry, your letter to editor can get published after a few rounds to the office. I mean, dil ka Ghubaar nikalne ke kaii raste maujuud haiN. If percent of Muslims is not too high in government jobs, there are all other avenues and business. Just an incident, whatever people may term Mulayam Singh Yadav (a majority of politicians and also public servants are guilty of corruption and nepotism) but he dared to fire at the Kar Sewaks. In the late 80s and early 90s, the Mandir movement was so fierce that despite any amount of lure for Muslim vote no government could have risked that. He did and it kept the faith of many Muslims in the inherent secular nature of this country and the fact that somebody stood for Me and the Mosque despite all odds. And there are always voices of dissent against any totalitarian regime. May be these are some of the reasons. I think extremism can't come to Indian Muslims because of our democracy that may not be perfect but is still the best in the world in many respects. Our Supreme Court is a great institution and we ought to be proud of it. Yes, Gujarat became a fasicst state but hopefully it would prove to be the last such pogrom. New laws against communal violence and riots are on the cards. Compensation for riot victims and justice will also come steadily. When you see Harsh Mander, a brilliant person, resigning from IAS just because he was shaken by Gujarat riots, and forming Aman Biradari or Teesta Setalvad fighting for victims of riots, your trust in the values of this country and society enhances tremendously. I don't think there is any cause for Muslims to get infected by any extremism. If people in failed Muslim countries where even organising demonstrations and rallies is banned or even writing a blog can be dangerous, get extremist I understand but not in India. Here you can be a Muslim of any sect, organise a rally or demo, stage a protest, climb up a tower in Delhi to demand 'that India should help Saddam', as a person had done, and what not. Remember the huge rallies on Caricature Controversy when lakhs poured on streets in India, whether rightly or wrongly, but can they come out in most countries in Gulf? That's why, I guess, a resounding No from Indian Muslims to any form of extremism. Aap logoN ka kyaa khayaal hai? Editor of Urdu daily, Siasat, Zahid Ali Khan was attacked in Hyderabad when he was returning home at night. 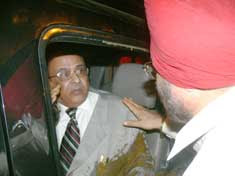 Khan's car was stopped near Mehdipatnam and filth was thrown at him by unidentified miscreants. But Siasat owners have already 'identified' the attackers and the mudslinging has begun. Hyderabad has three major Urdu newspapers, Siasat, Munsif and Etemaad. Siasat is the oldest and most respected and credited with revival of Urdu journalism. Khan Latif Muhammad Khan's Munsif recently took over Siasat in terms of circulation. Etemad is the latest entrant. It is owned by the Owaisi family and is clearly the mouthpiece of Majlis Ittehadul Muslimeen (MIM) though it is also a standard newspaper in terms of quality of print and content. When Etemaad was launched, the two old newspapers joined hands to fight Etemaad, which has got a foothold and sizeable circulation. But when it comes to mudslinging and attacking each other, these three well established newspapers cross all limits. Every few months one gets to see this sort of campaign to defame the other group. In the latest incident, Siasat squarely blames 'Majlis goons' for the 'dastardly act' and terms it as 'majlis ki ochhi harkat' in half-a-dozen screaming headlines. Munsif also reports the incident on its last page and even before any police investigation is complete, gives its verdict. The story begins with such opinionated sentence, 'Members of a political party that claims to be uniting Muslims (Ittehadul Muslimeen) intercepted the car of Khan and attempted to throw human excreta on him'. Arrey bhai reporting aur editorial ka farq bhi nahin malum kya? Of course, it is a condemnable incident. But the newspapers and their owners are themselves to be blamed for this sorry state of affairs. They have brought their differences on the streets and trade charges on each other. The attacks are often vitriolic and personal. Elsewhere also papers have their differnces but media houses don't splash these stories or use the paper to score over their opponents. Together they can serve Hyderabadis and Urdu jorunalism but they wash dirty linen in public so often that it causes harm to everybody including the reputation of these papers that have otherwise done a lot to raise the issues of Urdu-speakers in Deccan. Even if you write something on a blog about Hyderabad, the anonymous brigade of both MIM and Siasat supporters turn the comments section into their battlefield and make wild allegations on each other. Twice I have to change my comments policy at various blogs to save them from this propaganda. 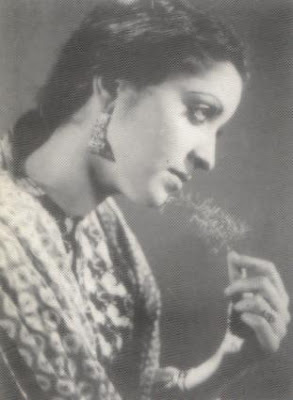 Ragini (Aahuu-chashm in Urdu/mriganayani in Sanskrit), who starred in movies like Shahjehan, Shireen Farhad, Sarhad, Sundari before the partition, and later made her mark in movies in Pakistan, died in Lahore recently. She was 83 and alone in her death. Once on her every step, Kunwar Sahab, used to place a note of Rs 100 in the Anarkali Bazaar and when she died in a small room, she was all alone, wrote Zahida Hina. She was born in 1925 in Gujranawala and named Shado. Her father's name was Seth Diwan Parmananad and her mother had diied durng her childhood. Roshanlal Shori of Shori pictures was amazed to see her 'tilismi' eyes. She was brought in the films and from Dulha Bhatti, she captured the eyes of movie buffs. Her hero MD Kunwar in the film Dulla Bhatti fell in love with her and later drank himself to death. In AR Kardar's film Shahjehan, she had played the role of Mumtaz Mahal. Nek Parveen and Farz were also hit movies before partition. In Pakistan she worked in movies like Akeli, Nazrana, Beqarar, Sharare, Mumtaz etc. A life size cutout of Ragini was posted in Lahore before the release of film with a strip of cloth on her eyes. On the hoarding it was written, 'yeh naqaab haT gayii to kyaa hogaa'. Her arching eyebrows and expressive eyes had captivated an entire generation. She married producer S Gul. But like many other great actresses of yesteryears Ragini also suffered in her old age. She had to leave her daughter's home as her husband didn't want people to know that her mother-in-law was a film actress. She was all alone in her death. Tehelka: Is being Islamic an important part of your identity? Have recent events forced you to think more about it? Shahrukh Khan: I’m not an atheist, I am a believer in God, and I don’t think it is great fashion to be an atheist. 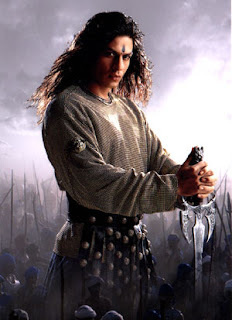 I am Islamic by birth, so I know that a bit better, though I’ve been brought up by Hindus most of my life, and I was fascinated by Ram Lila and things. All that hasn’t changed, but as I’ve grown older, and I see what’s happening to Islam around the world, I think it’s important that even without full knowledge of Islam, I need to be very clearly standing for the goodness of Islam. AR Rahman sent me a message once saying you are an ambassador for Islam. I think I truly am. I follow the tenets of Islam — peace, goodness, kindness to mankind. And I’m a normal guy. I think that is what Islam tells you to be. Tehelka: Are there things about it that worry you? Shahrukh Khan: Of course, there are actions by people who think they are Islamic, or are Islamic, that are very disturbing. But I think we are too quick to classify. She’s a Bengali? That is why she is like this. We like classification because it makes us more secure, the fear goes out. I stand for what a modern Muslim should be. I am married to a Hindu, my children are being brought up with both religions, I read namaz when I feel like. But I would not like to believe in four marriages even if my religion allows it. Lots of other things too have lost relevance, but that doesn’t mean I’m questioning the Quran. I’d like people to know that Islam is not only about being a fanatic, or radically different, angered person, or one who only does jehad. I’d like people to know that the actual meaning of jehad is to overcome one’s own violence and weakness. If need be, overcome it violently. Allama Iqbal is one of the greatest poets of the sub-continent but it might come as a surprise to even his most ardent fans that a symposium was held on Iqbal's 'kuchh' in Bhopal. Senior RSS and BJP leaders attended it [as Madhya Pradesh has a BJP government and all keyposts in culture department now have RSS sympathisers who are generally considered averse to Iqbal]. 'Kuchh baat hai ki hasti miT-ti nahiiN hamaari' and the RSS-BJP ideologues gathered at Aiwan-e-Mulla Ramoozi to discuss what lies behind this 'kuchh' in this couplet. The Iqbal Markaz conducted the event and MP Sahitya Academy chief Dr Devendra Deepak organised it. Speaker after speaker tried to dissect this 'kuchh'. [Iqbal might be turning in his grave with the interpretations. Some interpretations were really good but a few others were too wild and; far-fetched]. A police official said that Afghanistan prided on its cultural heritage but today it is a destroyed nation and so we must learn to protect our 'kuchh' lest we also get on the same path of destruction. A senior BJP leader said that 'kuchh' was so meaningful and 'the depth of the word here 'intellectually stimulating'--just the kind of stimulation which ever society needs'.....[my goodness]. ...is kuchh mein kuchh zaroor hai....Iqbal ka kuchh hamari sanskriti [culture] ...blah blah.....is kuchh mein nihit bhav ko samajhne ki avashyakta hai.....Surely, it was interesting event. At least Iqbal is remembered in Bhopal. Even when the poet's name was anathema at All India Radio and those in government avoided holding or participating any event on him, the State government not only aided Iqbal Library and assisted Kull Hind Allama Iqbal Adabi Markaz but also constructed the Minaar-e-Iqbal. Now the BJP administration is also enthusiastically working for spreading the work of Iqbal at the state-level though at national level they are not keen on Urdu or Iqbal. Where else anybody could have organised a seminar with the topic 'kuchh baat'. Would anybody have imagined holding such an event in his Lahore or Sialkot! The banners read 'kuchh baat' and the invitations also had this prominently mentioned on the top. Some newspapers find it odd and mentioned that it was a seminar on Iqbal's couplet. In fact, last year also a workshop on Iqbal's kuchh was organised in Bhopal. Nothing much an ordinary Indian expects from the government except that he keeps getting his' daal-roti/chawal' (meals) with perhaps an additional 'pyaaz' or chutney. He is used to the fact that corruption is institutionalised and nothing moves in bureauracy without connections or greasing the palms and thus the common Indian, unaffected by software revolution, whose sole aim in life is to live peacefully without getting into the proverbial trouble of 'court/kachehri/police ka chakkar', expects hardly anything. And he gets angry only when his 'daal-roti' gets costlier. The Newspapers and Channels may everyday boast that India grew by 9% or how many youths got package of 'several crores' in a foreign company in campus selection before their final exam at IIM, it is just hollow talk for him. The guy who works at a bania's shop or a hotel may not at all get a Rs 100 hike from the existing Rs 2200 monthly salary despite the owners promise. His India doesn't shine, it doesn't grow up by 9%. He gets angry at the reports when business honchos and FinMin speaking in posh conference halls, claim that the economy is looking up. When price of arhar(tuar)ki daal keeps climbing up every month and the onion gets unaffordable, the family of five has to cut down on something else to keep finances in order. Yes, the CEOs will surely get a raise (20-25%), the media bosses too will get it well. And naturally they can't see this under-current (they all missed it in last general elections). Some politicians sense it. They dread this quiet anger of Indian masses for whom the hoopla over an Indian earning a crore in US or UK doesn't make much sense. [Howsoever angry an Indian may be he avoids hitting the streets for total revolution, he may get overawed by ever rising multi-storey structures and keep silent, but the contempt is felt when governments suddenly get toppled]. India is not just a country of engineers and MBAs, or for that matter middle-level executives and babus. It has Hundreds of Millions who earn it the hard way--haath ki mehnat (manual labour). Forget computer, many can't afford a new slate that comes 500 times cheaper. The man who works at a tea shop near my office gets Rs 1500 a month. And each of their tribe is in millions in this vast country. So when pyaaz gets Rs 20 a kg, this person on the streets gets terribly affected. When the packet of milk (half-litre) costing Rs 10 goes to Rs 10.5 and then Rs 11 in three months, this man feels the real pinch. Yes BPOs are important but when TV channels scream over threat to jobs of 5,000 BPO employees, the plight of at least 5 crore farmers (in at least five of the 25 states at any given time) where crops have failed again, goes unnoticed. The upper class and the cream amongst middle-class may not feel the bitterness over Re 1 or 50 piase but these additional 'athannis' on milk packets work. BJP remembers it well. They lost Delhi state government and later the Union government and all their shine was covered with mud by this rural, urban poor and real India. Now suddenly it seems the Congress is realising that price rise is becoming an issue. Mahangai ya badhti qeeematein, jo bhi kahiye mudda ban chuki hai. TV channels may keep middle class India hooked with Matuknaths, Meeka-Rakhi, Malika Sherawat but the truth is that the failure to control prices of grains and essential commodities is going to hit the government hard. If Congress thinks it can get some seats in UP, it's a daydream, they can at best expect a double figure. And the general elections are not too far. Manmohan Singh's image of an honest man who is conscious to the problems of ordinary Indians, aside...people are wondering why this is happening. After all, why can't an economist PM and his seasoned FM look beyond the Sensex. Gas cylinder is now costing over Rs 320. The cement bag which was Rs 125 is suddenly over Rs 200 in a year and all this happens when FM urges the companies to take measures. Just imagine the state of affairs that the day Chidambaram asks banks to keep Home Loan Rates under check, the ICICI raises the price of home loan on the very same day. And when all this happens regularly, the common man, spits on the ground and says, 'kyaa mazaq hai, saale ch*&ia samajh rakha hai'. Crude it may seem but that's no joke, hundreds of millions of Indians have to run their household in Rs 2,000-Rs 4,000 despite hard labour for long hours. Price rise is the biggest issue (I don't use the economists' term Inflation)....I am angry and my rant will continue. 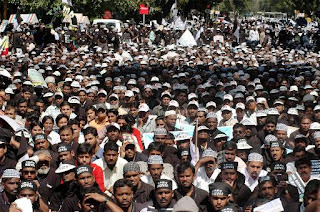 Thousands of Muslims under the aegis of Tamil Muslim Munnetra Kazhagam (TMMK) marched from Ramlila Ground towards Parliament on Wednesday to draw the attention of government towards the socio-economical and educational backwardness of Indian Muslims. Former Prime Minister VP Singh flagged off the march early in the day. Jamiat-e-Ulama, Jamaat-e-Islami, Muslim Personal Law Board, Milli Council and other Muslim organisations participated in the demonstration. They were urging for implementation of Sachar Committee's recommendations and declaring entire Muslim populace as backward. Holding placards the demonstrators demanded protection of minority character of Aligarh Muslim University (AMU), Jamia Millia Islamia and similar institutions. Tamil Munetra Kazhgam's chief Professor MH Jawahirullah led the march. Activistis of Muslim Majlis-e-Mushawarat, All India United Muslim Morcha, Indian Union Muslim League and several leaders, MLAs, ministers addressed the gathering. It is not surprising that once again this huge rally did not get the coverage in mainstream media or electronic channels. President APJ Abdul Kalam offered the 'Jume ki Namaaz' [special Friday prayer] at Fatehpuri Masjid in Delhi. It was rarest of rare visit of the President to any mosque in several years. Until now we had brief reports about Kalam Sahab's prayers. News agencies reported annually that he prayed at the mosque within the Rashtrapati Bhawan on the occasion of Id Ul Fitr and Iduz Zuha. 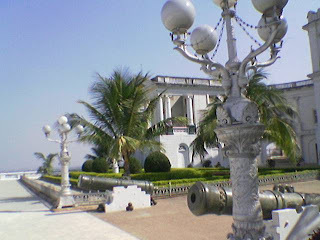 Though not many are aware about the mosque that exists on the premises of the President's House. But today he surprised everybody with the visit to the historic Fatehpuri Masjid. The president interacted with the Namazis and also met Mufti Moazzam. Of course, there was extra security. 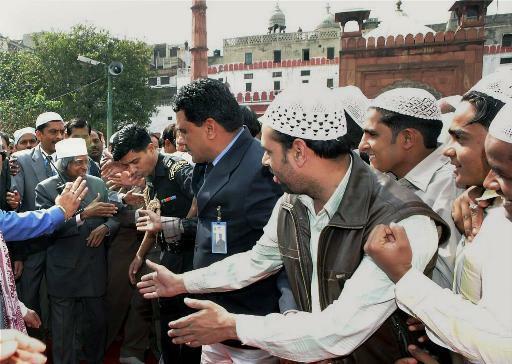 Tens of thousands of Namazis in the mosque shook hands with arguably India's most popular president. In pictures here one can see the enthusiasm with which he was greeted. The visit could be symbolic. The end of his term is nearing and president is not keen on a second term. 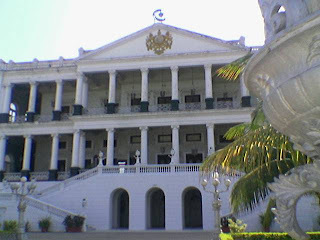 Avul Pakir Jainulabideen [Zainulabideen] Abdul Kalam has brought not only dignity but respect for the President's House and the highest office of the country. He is the sort of persons who in his role as President, inspires millions of children and urges them to dream and it is this role which I salute. His religious side has not been known to us much and there were, from some narrow-minded sections [including Muslims], questions raised on his beliefs, about being a practising Muslim [and also a rumour which I often heard in South Indian cities among Muslim that I don't want to mention]. The President's visit and prayer at the mosque not only demonstrate the unique secular nature of our country. In his personal life, he is a Muslim.He has been to religious places of other religions also. In the past, the country has seen two Muslim presidents, first the dignified Zakir Husain and later Fakhruddin Ali Ahmad during Indira Gandhi's regime as PM. They came from North and were representatives of Muslim culture of Northern India. Kalam comes from Southern part of the country. He has never been overtly Muslim during the tenure. And also, the Sadar [Rashtrapati] never seemed to have made a deliberate attempt to appear un-religious either. He has all along kept that delicate balance with perfection. Will we ever have such a President again? 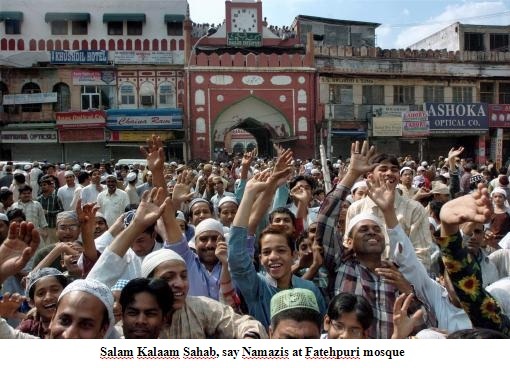 PS: My friend, Pandit Ji, who saw photos of Kalam, asked me why he didn't go to Jama Masjid. And I also thought about it. 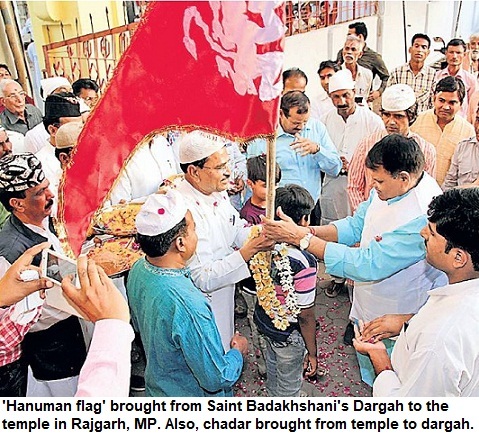 Is it because there the Shahi Imam could have turned it into his show rather than just a normal visit to mosque? The Fatehpuri mosque houses a seminary also. 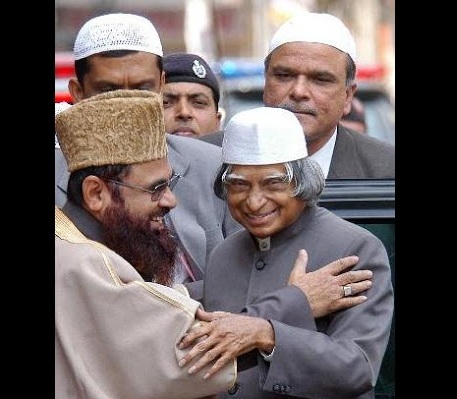 Kalam is known to be influenced by Sufi thought. We are commemorating the 150th anniversary of the War of Independence, termed as Gadar or Mutiny by the British. Mughal Emperor Bahadur Shah Zafar paid a heavy price for leading the rebellion. His sons' eyes were gouged out and brought before him as a gift in a tray. They were executed. He was sent to Burma where he died in prison and was buried. 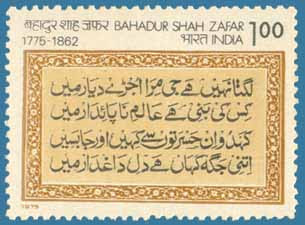 The Indian government had this stamp issued in his memory long back. ...I think in that sense Savarkar has kidnapped your narrative of 1857. He emphasised strictly Mangal Pandey in Barrackpore and Rani of Jhansi in Jhansi. Now, they are great heroic figures and great national heroes, but ultimately, in the story of 1857, they are frankly side-shows because of the 1,39,000 sepoys who rose against their Britsh officers, 1,00,000 went straight to Delhi. Now these are upper-caste Hindus, and who do they get to lead the rebellion — the Mughal emperor.